Well, we’re halfway through the first month of your new school year…so how about a giveaway to celebrate? 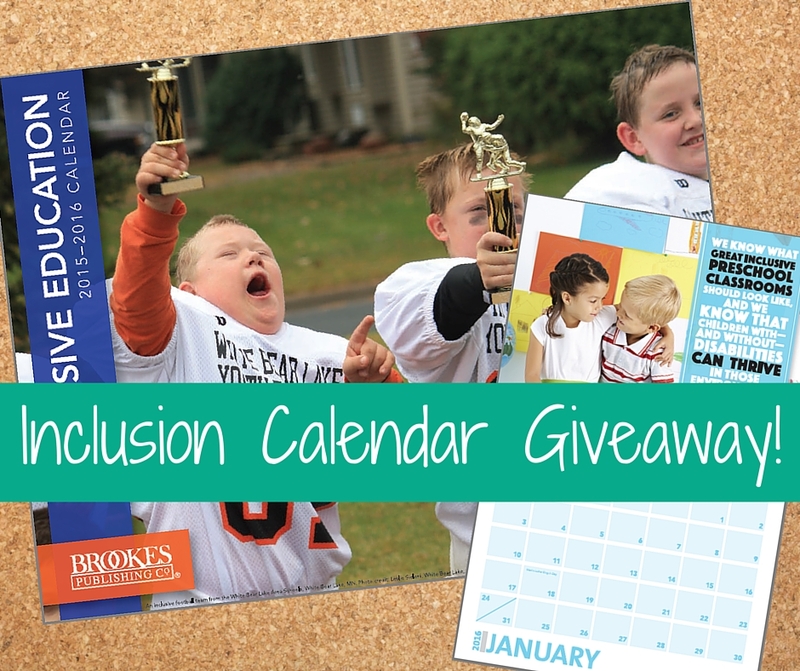 Over the summer, we unveiled the new 2015-2016 edition of our popular Inclusive Education calendar, featuring the winners of our Inclusion in Action cover photo contest. 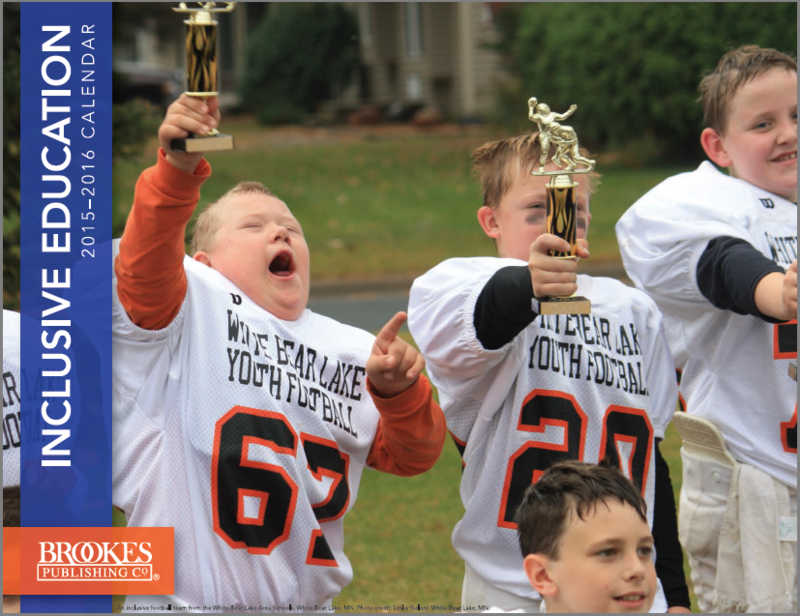 (We were thrilled with the results of the contest–you guys sent in awesome pictures of your students and children, and your photos spoke thousands of words about the benefits of inclusion.) 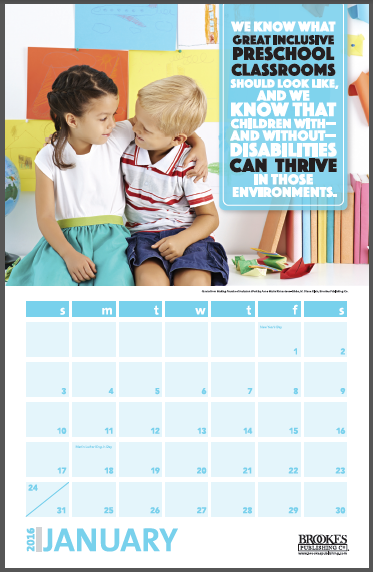 A free printable version is available now on our website, but we’ve also commissioned some extra-pretty, professionally printed calendars to give away to our Inclusion Lab readers. That’s it! 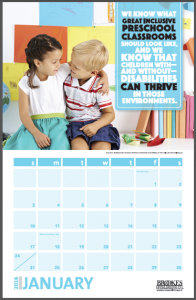 Looking forward to hearing your inclusion “why”s, and hope you enjoy your new calendar. The contest will run for a week (ending at midnight EST on 9/22) or until our supplies run out. Scroll down to add YOUR “why I support inclusion” comment! I support inclusion because it mirrors the diversity of the real-world. I support inclusion because all children learn best in high quality environments with peers. I support inclusion because every kid deserves equal opportunities to reach their full potential! I support inclusion because I truly believe that separation only continues to contribute to alienation and lack of education! We should focus on our Abilities not our disAbilities! I support inclusion because we all have a valuable contribution to make to our community! I support inclusion, because we can’t complain kids can’t behave appropriately in their community if they have no opportunity to practice in their community. I support inclusion because together we are better, because my liberation is bound up with others’, and because diversity is beautiful. In a perfect world the word ‘inclusion’ wouldn’t have to exist because all would be accepted regardless of perceived ability. I support inclusion because exclusion is just fundamentally wrong. I support inclusion because: (a) it provides access to the gen ed curriculum, which is mandated by federal law (IDEA 2004), (b) students must be subject to the least restrictive environment (LRE) as appropriate for the educational needs of the child (again, federal law), (c) inclusion provides experiences/exposure for students w/ out disabilities, (d) the instructional strategies that work for students with the most substantial learning challenges also work for students without IEPs, (e) universally accessible instructional design provides a mechanism for learning regardless of disability status, and finally (f) supplanting general ed curriculum often creates a situation where we expect students to catch up by going slower (exclusive education is an inherently flawed model). We need a continuum of service with inclusion as the backbone. As a Child Development/Inclusion Coordinator, I support inclusion because I believe every child has possibilities and if you can’t learn the way I teach, then I should teach the way you learn. I believe in every child…. I love inclusion because it works! All kids do better together And all kids deserve the best! Who could support exclusion? It doesn’t make sense to sort and separate! I support inclusion because expectations for students in segregated settings are low. Students with disabilities are more likely to have access to the general education curriculum in high-quality inclusive settings providing them with a greater opportunity to learn. It’s a ‘no brainier’ for me!